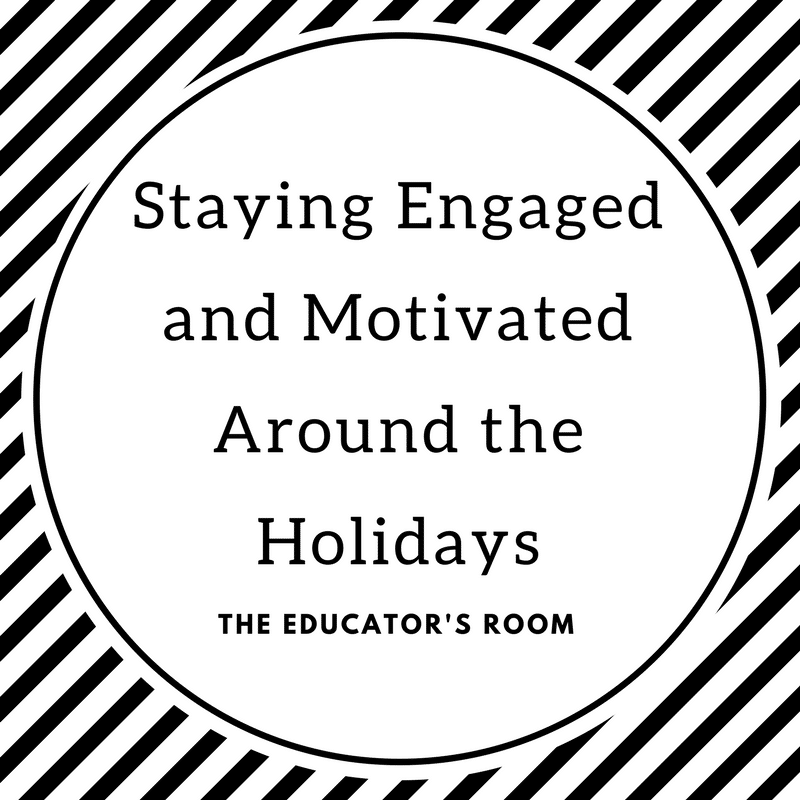 As teachers, we often talk about ways to keep our students engaged and motivated during the holiday season. With lengthy breaks just around the corner, it can be easy for them to lose steam. But what about for us as teachers? The reality is that teachers, just as much as students, look forward to time off. I know that after Thanksgiving when an extended break is just weeks away, I feel myself getting antsy. Because teacher burnout is real, that time away from school/work over the holidays can be just what the doctor ordered. Mentioned in an earlier post last month about self-care, our students can sense our feelings, and they feed off of them. Which is why it’s very important to keep things in check. But, some things are easier said than done. So, how can we stay motivated, yet sane, while not losing sight of our goals for the school year? Be sure to stick to a schedule. It can be tempting to throw in the towel and wind things down before a holiday or summer break, but it’s important to stay on track. Make sure that you are setting goals to hit before the break and try keeping to your regular routine. Be realistic about your expectations. As much as you might be longing for a break, your students are too. You want to keep the expectations of your students high, but not unreasonable. In addition to keeping realistic expectations for your students, be sure that your the expectations of yourself are realistic as well. Try not to put any unnecessary pressure on yourself. Plan a Thematic Unit. A theme-based project or unit can be a nice way to shake things up before the winter break and keep your students engaged. You can also try to center your theme around the season. For instance, as an ELA teacher, I might consider a theme where students read and write poetry inspired by winter and the holidays. Or, if you are a science teacher, you might teach a lesson on the reaction between ice and salt on the roads and why it melts. Collaborate with your peers. Building off of the idea of a thematic unit or project, it might be fun to collaborate with one of your peers in the form of an interdisciplinary unit. This also gives you a shoulder to lean on. Having another teacher in your corner can make things much more manageable. Clean or re-arrange your classroom. Sometimes a fresh look or arrangement can make all the difference! Marie Kondo is definitely onto something when it comes to her methods of organization. Try setting up your classroom with only items that spark joy, and challenge your students to do the same! Lastly, the holidays can be stressful for a lot of reasons, so it might feel like you have a bit too much on your plate. Take it easy, and make sure that you are getting the care and the time to yourself that you need. These are great suggestions. Many times it can be tempting to just show videos or devise a lesson plan that is heavy on holiday fun. Having a schedule and sticking to it – pushing through to the end, I think, helps develop a student’s work ethic. Just because we’re nearing the break doesn’t mean the learning stops. However, it could cause some friction since students and teachers begin to feel burned out by this time. Which is why I am glad to see #2 and #3 on this list. Planning a thematic unit and with your peers not only shakes things up before the break, but also opens the door to further collaboration after the break, To often we see teachers become isolated in an “egg carton” situation (teachers together in the same group, yet separated from each other). Finally, I like the statement on re-arranging the classroom to reflect things that spark joy as well as interest. I am US history teacher, so in addition to posting things related to our unit study – I think we can take it one step further. Possibly working some posters or photos of what Christmas was like for soldiers abroad during the 40’s and 50’s. Or, perhaps we can tie it into other things. For example, for teaching Michigan History I can teach about ship wrecks during the period of American industrialization. One of the worst ship wrecks in Michigan history was a cargo vessel bound for Chicago carrying Christmas tree harvested from the Upper Peninsula.